The tome is definitely the read for anyone interested in our current understanding of reality from the ground up. It doesn’t shy away from mathematics like most popular science accounts. Rather, as mathematics is the gasoline to travel the Road, it fuels the reader up along the journey. Yet the mathematics quickly progresses from exploring what a number exactly is to a graduate level textbook equivalent and this whirlwind journey is not to be taken lightly. Rather than a Road, I actually consider The Road to Reality to be more of a Roadmap indicating a path to reality without fully providing the reader with the tools to travel it. It did work for me–a Physics PhD student–as most of the book was putting familiar things in a grander context. However, for those not on the Road as a career, supplemental work is probably needed to get the most out of the book. In the that spirit I am presenting a condensed Roadmap in chunks of 6 chapters (there are a whopping 34 chapters covering 1123 pages) with additional links to online courses (primarily sourced from the wonderful Khan academy, Coursera, and MIT OCW). People have always been curious about the laws which govern the universe. There is a mysterious connection between mathematics and nature, a binding between abstract entities which can never practically be realized and reality. Penrose goes through some of the philosophy behind this deep apparent truth, and digresses to discuss how physicists explore it. The abstract mathematics has a subjective beauty and simplicity to it that has traditionally helped to guide scientists and mathematicians in the right direction. 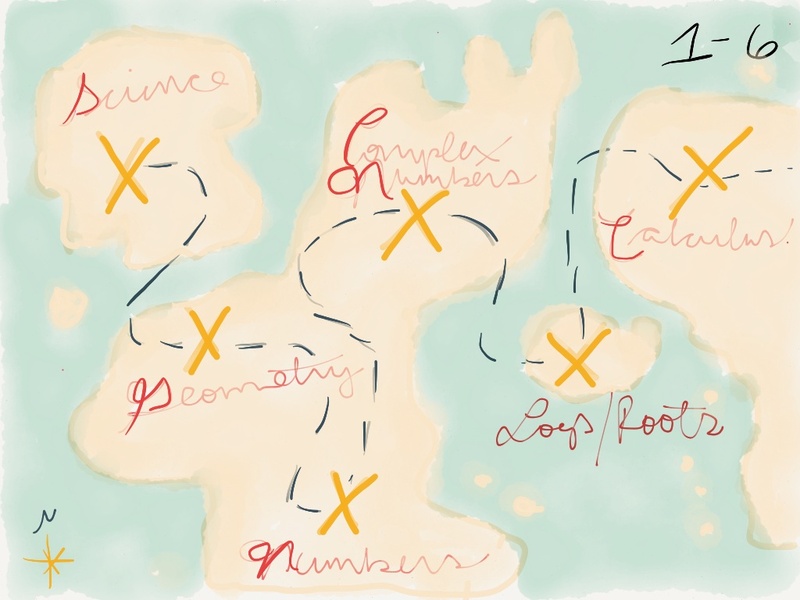 Penrose reviews the geometry of logarithms, powers and roots, in the context of complex numbers. If you aren’t familiar with these concepts in terms of real numbers, explore them in that context first and learn to manipulate them to solve real number equations before moving on to the complex numbers. When you are ready proceed to do the same with complex numbers. But first you will have to learn the techniques–not only to solve equations on your own, but to be able to input them to a computer, understand and follow later notation and equations, and eventually to learn how to think in a manner that will help you write your own equations which can be solved with the techniques of calculus. Stay tuned for my next installment of the Roadmap of Chapters 7-12. Comment, like or share to speed it on its way. This is awesome, thank you so much for putting this together. I am a physics layman who has since I was very young had a great interest in the subject (probably ever since reading a Brief History of Time in elementary school). Although not averse to mathematics, I have little training in the subject so RTR has definitely been difficult. This is perfect for me as I definitely don’t have the focus to just work through a textbook on my own, but I am willing to put in effort. Thanks. Thanks for stopping by! I should put up part II soon :-). Thank you so much, I was just looking for something like this! Unfortunately my math education more or less ended after high school, but I remained close to and recently quite enthusiastic about math and physics. With your guide I feel like I may be able to tackle the book if I put in much effort to train myself up. It is so great that there are all these online resources such as coursera, edx, khanacademy, udacity, mitocw etc. Recently I spent much time on khanacademy, and was wondering how cool it would be if there would be a way for everyone in the world with an internet connection to start from 1+1 and go all the way up to understand even the most subtle points of a complete guide to the universe such as it is presented in the Road to Reality! I hope there will be such resources soon gathered in one place such as on khanacademy with videos and practices, I do not see any reason why there could not be one! Until then I rely on your guide and the book 🙂 Thanks so much again!